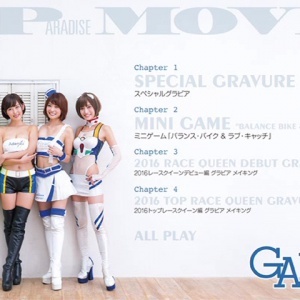 This is one of a set of three DVDs released to cover the Image girls of the Formula Nippon Championship in 2004. 2005 Ark Tech Motor Sports race queens Yuria Takenouchi, Mako Uemura and Ikumi Sugaya. Campaign girls from the TAS 2004. Campaign girls from the TAS 2005. The first in a series of sixteen DVDs featuring Race Queens and Campaign girls from auto shows and events. Campaign Girl 10. The 2004 Auto Gallery Tokyo Race Queen pageant and Wagon Carnival. Formula Nippon promo event held in 2001. Featuring amateur video from trackside, pit-lane and the on stage presentation of the race queens from a Formula Nippon event. Some famous race queens on campaign duty at the 2005 TAS. With the models from the House of Color taking centre stage.